One of the first movie licenses, based on the Disney movie, you must guide Tron through the stages to advance to the next level. The gameplay consists of 4 sub-games, each of which is a seperate game in its own right. You choose which of the 4 paths to take and the type of game you must play in each path is not revealed until selected. The four subgames are Light Cycles, Grid Bugs, MCP Cone and Tanks. Light Cycles is the more recognised movie tie-in, and you are in your fast powered cycle pitted against computer opponents. As the cycles move around the grid they leave a solid trail behind them which cannot be touched. The trail is removed when the cycle to which it belongs is destroyed. Your objective is to trap the computer cycles into colliding with the trails or the arena walls. Destroying all opponents completes the stage. The cycles cannot stop and acceleration is controlled by the fire button. Grid Bugs is probably the easiest stage and sees Tron against enemy insects. You can exit the stage at any time by stepping into the beam of light (I/O Tower) in the centre of the screen via either of the two side entrances, but you must exit before the level timer reaches zero. The bugs are swarming around the screen and constantly dividing and multiplying in number. You can move Tron's arm to aim and fire disks at the bugs to destroy them. 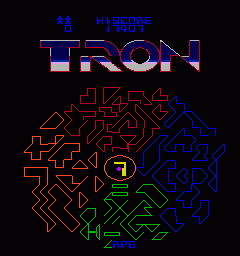 The MCP Cone stage sees you controlling Tron attempting to enter the vacant area at the top of the playfield. However, blocking your path is a rotating wall of coloured blocks, similar to Breakout bricks. The blocks are also moving down towards you, and contact with them is fatal. 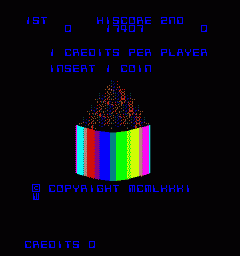 You can fire disks at the blocks to destroy them and clearing all the blocks on the stage awards a bonus. 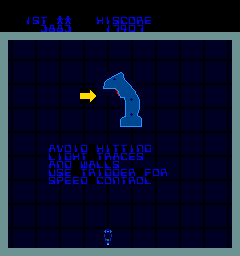 In the final stage you control a tank in a maze of walls and passages. You must destroy all the enemy blue tanks or red Recognisers to clear the stage. The enemy tanks must be shot three times each to be destroyed whereas a single enemy shot will destroy your tank. In the centre of the maze is an escape teleporter which places your tank at a random position in the maze. You can rotate the tank's turret to aim and fire. There are 12 levels of difficulty for each of the 4 games: Level1=RPG , 2=COBOL, 3=BASIC, 4=FORTRAN, 5=SNOBOL, 6=PL1, 7=PASCAL, 8=ALGOL, 9=ASSEMBLY, 10=OS, 11=JCL and 12=USER. Entering MCP Cone: 1,000 points. MCP Cone Block: 25 points. Destroying all MCP Cone blocks: 1,000 points. Light Cycles: On the first few stages you are faster or the same speed as your opponents, so you can cut across their tracks to block them off. On later levels where they are faster than you, it can be wise to trap yourself into a large space and slowly draw inside your box, waiting for the enemy cycles to crash of their own accord. Light Cycles: A quick zig-zag will often confuse a computer opponent into crashing. Running alongside them when they only have a narrow route and no room to turn is a good tactic as you can force them around the edge of the screen and cut them off. Grid Bugs: Try to clear an opening near an exit and stay near it picking off as many bugs as you can, entering the I/O Tower as late as you can to maximise your score. Grid Bugs: You can move at the start of the level, a split second before the bugs, so use this time to plan your route into an open safe space. MCP Cone: On later levels, it's not possible to clear all the blocks, so create a gap of 2 or three wide, which will be enough to run through to complete the stage. On the first levels you should aim to try and knock out all the blocks for the bonus points. Tanks: As long as your tank is not covering a blue trace, any tanks on that trace's level cannot see you, but they can crash into you. This means you can move slightly out into the same row/column as the enemy and bounce shots off the walls at them. Parking halfway inside the transporter is a good safe place to stay and fire from. You can fire through the transporter at enemy tanks. Tanks: There is a maximum number of bullets allowed on screen at a time, so if you fire rapidly, you can even prevent enemy tanks from firing at you at all. All Tank and Light Cycle stages have infallible patterns which can be used to complete the stage. It is simply a matter of learning the correct movements required. For details of these patterns go to the Tron Strategy Page for a complete list.